Dehesa Frías is a farm located on the banks of the Guiznar reservoir. La Dehesa can be found in the Sierra Norte de Sevilla Natural Park, which covers a large part of the Dehesas de Sierra Morena Biosphere Reserve reserve, where the landscape is predominantly made up of holm oak and cork oak trees along with a fauna consisting of deer and wild boar. Diversification and innovation in traditional activities in a mountain and meadow environment such as the Sierra Norte de Sevilla Natural Park. Commitment to renewable energies for alternative, viable and sustainable use in rural areas. Commitment to integrated agriculture, not disturbing the environment of the Natural Park. Elimination of intermediaries between agricultural-livestock production and the end customer. Defence of respectful hunting activities compatible with the maintenance and improvement of the environment. Responsibility for the forest environment, long-term sustainability of our pasture and, in turn, our company. Outreach agricultural activities for people outside the rural sector. 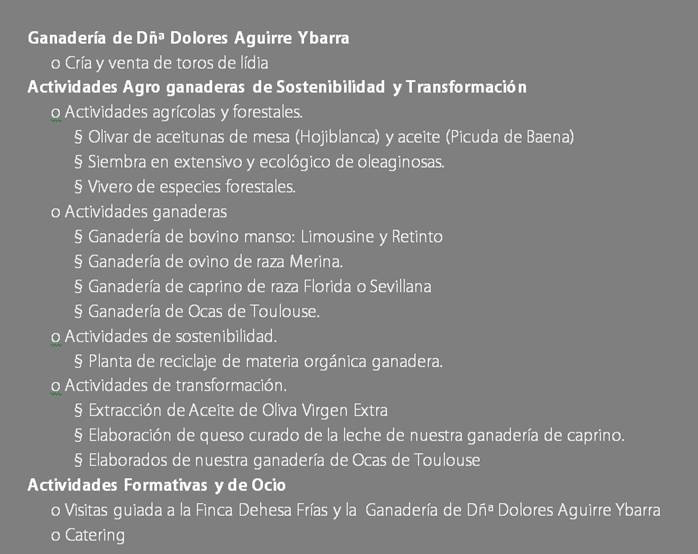 Although the main activity of Dehesa Frías has been and still is agricultural-livestock, especially, fighting bulls (Livestock of Mrs Dolores Aguirre Ybarra), sheep and pigs, in recent years we have carried out an intense diversification strategy including transformation and leisure activities, whilst always respecting the environment around us. Since its inception thirty years ago, the last few years have undoubtedly been the most diversified in the activity of Dehesa Frías. To traditional farm activities we have added several initiatives that do not seek to do anything other than increase the profitability and sustainability of a severely affected sector as is the agricultural-livestock sector. These actions allow us today to present a company that combines the tradition of the Andalusian countryside with ground-breaking initiatives in production and sustainability in the natural environment. Dehesa Frías continues to search year after year for innovation and diversification and as a result, we have been recognised as a leader in sustainability in the Sierra Norte de Sevilla.